The vintage acrylic pearls are a whopping 20mm in diameter. Five of them are wrapped with tiny silvery seed beads and 3mm light Colorado topaz round Swarovski crystal beads, then strung together with 6mm crystals of the same colour. The strand is quite long -- over 8 inches; but with beads this large, when you bend them into a circle, the inside measurement is deceptively small; in this case, about 6-1/2 inches, or a good fit for a normal-sized wrist. The clasp is a gold plated safety catch. Such an innovative design could only come from SPARKLE PLENTY! 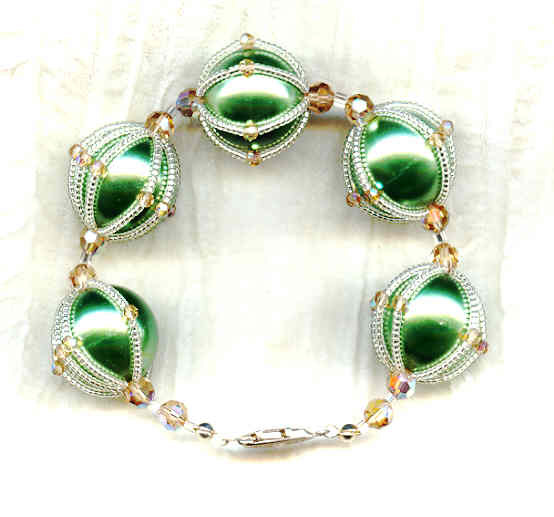 light amethyst grapes and sage green leaves have been painted by hand onto both sides of black rectangular glass beads. The beauty of this bracelet is in the spiral design.